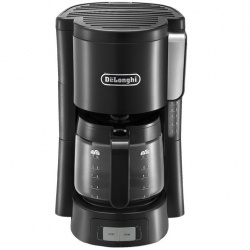 The De'Longhi ICM15240 filter coffee maker features a warming plate, auto shut-off, water level display, 2 different brewing speeds and is a non-drip device. Uses disposable filters - a hygienic option which will also save on cleaning. If you love the great taste of coffee, you’ll love the freshly filtered flavours of coffee from a Buckingham Stainless Steel Coffee Maker. It reaches optimum brewing temperature 50% faster* and features advanced showerhead technology so you can enjoy a richer coffee flavour with less wasted in the filter. 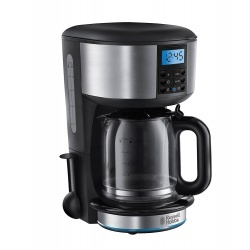 It has a 24 hour programmable timer that allows you to set your machine to have your coffee ready and waiting first thing in the morning or after your evening meal, whenever you like it best. A blue illuminated light ring comes on during brewing and stays on during the ‘keep warm’ stage. Easy to use and with a dishwasher safe reusable filter, the Buckingham Stainless Steel Coffee Maker is beautifully compact and stylish too. It can make up to 10 cups at a time in its 1.25 litre glass carafe and, if you don’t need that many, it can be set to make 2-4 cups. Improved temperature control means water reaches the correct temperature for coffee more efficiently and in line with the Specialist Coffee Association of Europe (SCAE). This is the standard set by the people who know how real coffee should taste. So if they love it, you should too. NESPRESSO has developed a unique worldwide capsule extraction system, which controls all parameters to extract the perfect espresso. Not all coffee machines are born equal. Delonghi's Autentica bean to cup coffee machine grinds your choice of fresh beans for every cup, with one touch of a button. The Autentica embodies the key features of all De'Longhi fully automatic coffee makers with 'something more and special' for the perfect coffee. Make doppio espresso for extra aroma and a boost of energy; enjoy drip coffee with the 'long' function, or use the traditional milk frother for cappuccino, latte and more. Personalising your coffee has never been easier. For the tea lovers, this machine also makes plain and simple hot water.